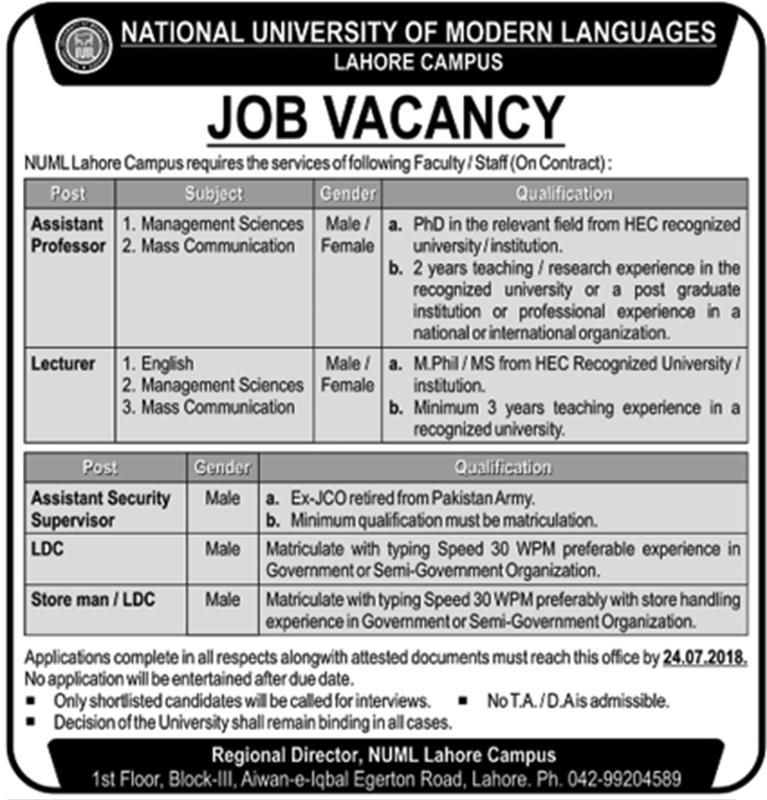 National University Of Modern Language (NUML) Lahore Punjab. a. PhD in the relevant field from HOC recognized university/institution. b. 2 years teaching/research experience in the recognized university or a post-graduate institution or professional experience as a national or international organization. a. MPhil / MS from HEC Recognized University/Institution. b. Minimum 3 years teaching experience in a recognized university. a. Ex-.JCO retired from Pakistan Army. b. Minimum qualifications must be matriculation. Matriculate with typing Speed 30 WPM preferable experience in Government or Semi-Government Organization. Matriculate with typing Speed 30 WPM preferably with store handling experience in Government or Semi-Government Organization. Applications complete in all respects along with attested documents must reach this office by 24-07-2018, No application will be entertained after due date. • Only shortlisted candidates will be called for interviews. • No TA. DA is admissible. • The decision of the University shall remain binding in all cases.